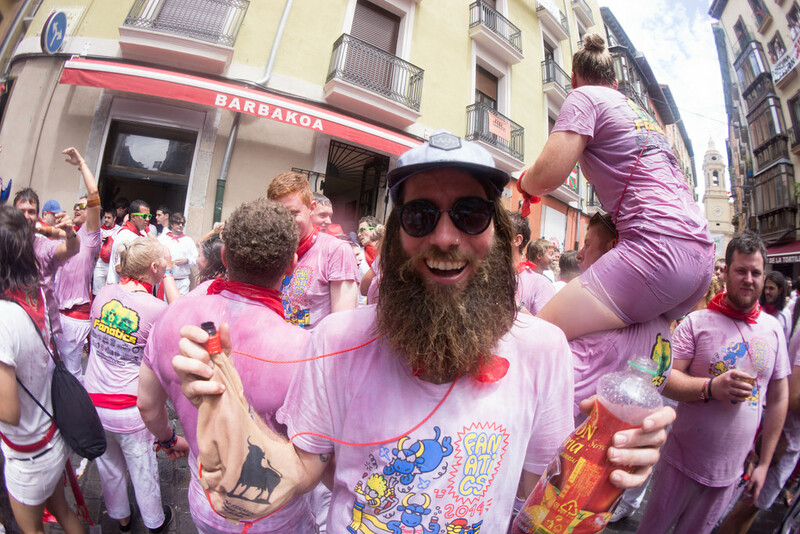 These upcoming pages of The San Fermin Echo were first published in short form in the daily Navarran newspaper, ‘Diario de Navarra’ and in a longer version on their digital pages, every day from the 5th to the 15th. They’ve been changed a bit from the original as it’s now post-fiesta, but as San Fermin for me doesn’t begin to fade until a couple of months after it’s all over, we thought it would be nice to repeat and re-live those heady days of San Fermin 2014. We’ll probably put out two a week, so this first one has the day before fiesta, the 5th of July, and immediately following below it the one of 6th, when the craziness began. Fiesta is over now, but remember…¡ya falta menos! July 5th…one of the great days of the year for many of us. Okay, it may not officially be fiesta, but unofficially for those of us who have arrived in town early, it is. It’s like the day before Christmas as a child. You know what’s going to happen tomorrow and you can feel it and taste it, and the anticipation is almost unbearable. That’s July 5th for so many who have been here before. And I know, if it’s your first time, that you can also sense it in the air, that unmistakeable impending shift in the scheme of things as Pamplona is about to go spinning wildly off axis and fiesta begins. It doesn’t happen until midday tomorrow but things are already wobbling now. You can taste the atmosphere and I always say I reckon you could actually take a photograph of it, because just look at the place…it’s buzzing. This could possibly be the first time that a Spanish newspaper has dedicated a page in English to its big event, to run every day of the fiesta. Indeed in this case, that includes the day before it begins to the day after it ends, so I hope you enjoy this and those to come. I know what you’re thinking. How can a place 80 km from the sea have a tidal wave. Well, it can’t of course, unless it’s a human one, and today this landlocked town will experience its own yearly inundation as a tsunami of foreigners and outsiders flood into it in preparation for the greatest fiesta on the planet. How it copes with so many people in such a small space, so much rubbish and so many accidents, injuries and all the other things going on or about to happen, is down to years of practice, planning, preparation and perhaps pure luck. Many times I read in the eighties about how, especially over the weekend, the town’s infrastructure was close to collapse. Yet somehow, and with the hard work of many unsung heroes, (think of the street cleaners,) and many people often hidden out of sight, (think of the sewage workers) the town kept going. For so many of us these dates, July 6th to the 14th are carved in kryptonite onto our very hearts and deep into our souls. They are the immoveable dates to an irreplaceable fiesta…but it wasn’t always like this, because the 9 days of nowadays have chopped and changed over the centuries, and even the month wasn’t always set in stone. Or should that be cobbles. Once upon a time in Pamplona the fiesta took place in October but the people got fed up with the weather, especially in 1590 when it was actually cancelled, so in 1591 the fiesta was moved to summer and it has been like that ever since. Lucky us. They decided to combine fiesta with a market and fair that was already going on around the 6th and 7th, and originally it lasted for two days. But as other events were added the fiesta was extended until the 10th and that’s the way it stayed for a while, until if one looks at the earliest surviving posters from the end of the 19th century, the events, if not the dates, are listed on them and there is everything from the religious acts, of course, to the fights and runs, concerts, fireworks, the bullfighters, fairs, exhibitions, illuminations, literary competitions, afternoon music…in short, fiesta. The Plaza del Castillo as it once was, over 100 years ago. Not every year gives us the dates but the first poster I can see that changes the dates from the 7th to the 10th appears in 1910. Suddenly we get July 6th to the 18th…just imagine! 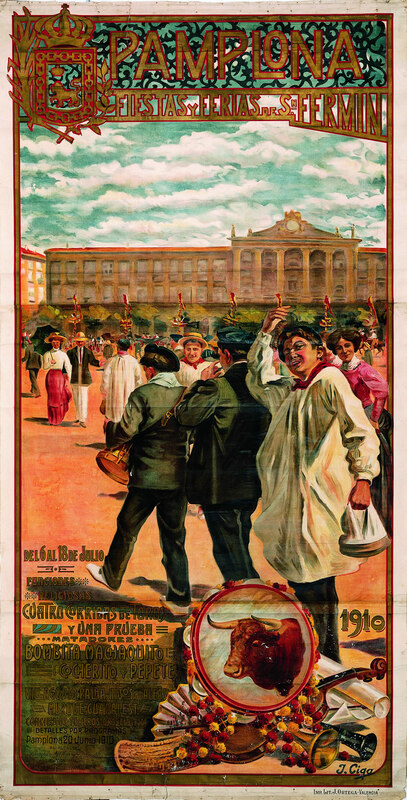 And it’s a beautiful poster too as it shows the Plaza del Castillo as it used to be before the southern central façade of what was the Teatro Gayarre was moved around the corner, and the enclosed square became open, giving it for me a slightly bare and disjointed appearance. And don’t get too excited by the dates and the thought of nearly a fortnight of fiesta either, I’m afraid. I actually have an original programme from 1940 with the dates 6-20th July on the front, and the main part of the fiesta is the 6th to the 14th, with 6 corridas and encierros, (the 11th and 12th appear to have had no runs, although they may well have run novillos, young bulls), with fiesta as we know it ending on the 14th. Those last six days were made up of concerts in the Plaza del Castillo. Every day I’m going to try and find one surprising or interesting fact about fiesta that has been forgotten in the mists of time, or perhaps just pop in a piece of history about something. 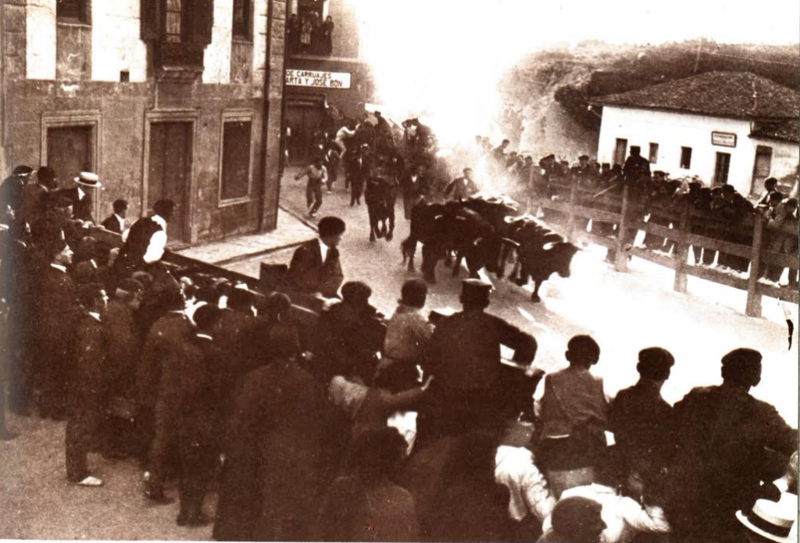 Today, because we have no bulls or bull runs, I’m going to recount a bovine related one which also happens to be one of my personal favourites: Did you know that in the past they would sometimes have two bull runs in the morning? Oh yes. Not officially of course, but out of necessity. There are records from the end of the 19th Century and into the early 20th of double encierro’s. This was normally caused when one, or more, of the animals returned to the corrals, or refused to leave. That meant once the rest of the bulls were safely in the bullring pen, the toril, the rest of the herd were run back to the Santo Domingo corrals to pick up the strays and head back on what became encierro number two. The last time this happened was in 1927. Tomorrow I’ll tell you what they did to fix the problem. The top of Estafeta, and turning, as you run, sharp right. An encierro from 1918. So as fiesta can be overwhelming sometimes, or perhaps you just like to see what’s out there, every day there’s going to be a suggestion of how to escape the madness, just for a little while. But even as you’re escaping, and you’ve made it over those city walls, some of you will still find the insanity rumbles on inside your head. No escape of the day today, though…after all, why would there be? You’ve just arrived! Good luck.